When buying a new machine isn’t an option, Gasbarre can bring your machine to like-new performance for a fraction of the price. 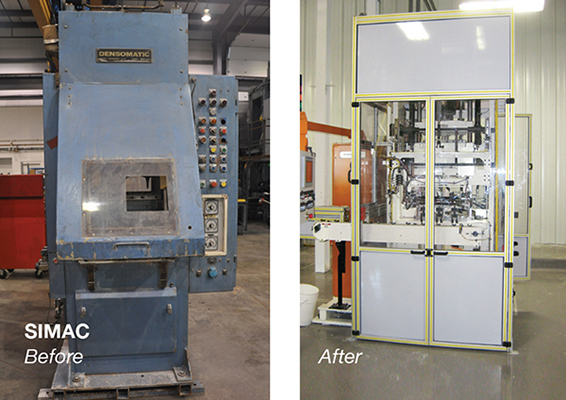 Our state-of-the-art rebuild facility and deep and broad experience ensures a quick turnaround of your press to its original form (or even better than original with selected upgrades), with a warranty that fits its reborn status. 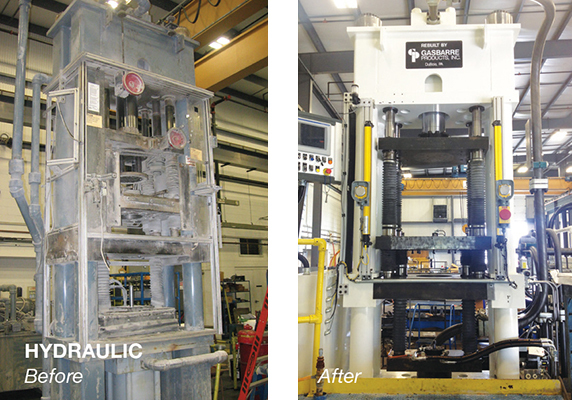 When the time comes to consider a rebuild, a Gasbarre Certified Press Rebuild is always the right choice. Critical centerline components (die set, & upper ram) rebuilt to improve tolerance and accuracy. Other customer requested repairs as well. Fastest and least expensive. Includes Gasbarre Base PLUS all ejection components, crankshaft bearings, clutch rebuild, plate float cylinders and more. Improves press tolerances and part ejection while minimizing tool wear. Condensed scope and enhanced reuse of components. A like-new, full-warranty press with 40-60% savings compared to ordering new. Gasbarre Prime is a major overhaul that includes complete disassembly, evaluation, reconditioning, upgrades to latest standards, reassembly and performance evaluation. All mechanical, hydraulic, and electrical components are inspected and tested. A complete list of reworked/new components is provided as part of the initial quote. Our rebuild process begins with a pre-rebuild condition audit, including a review of maintenance records, structure assessment, and evaluation of component health. We then supply a list of recommended productivity and reliability upgrades, as well as mechanical upgrades. 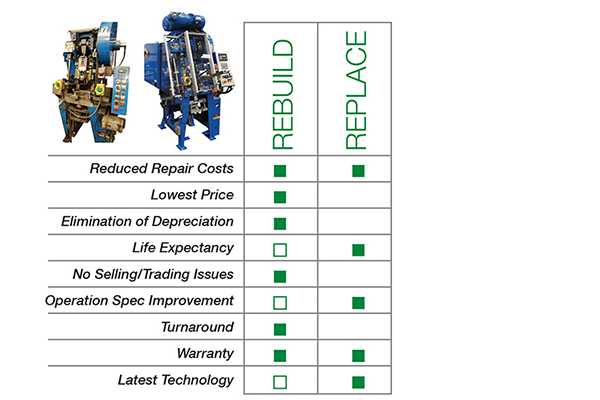 The value of the Gasbarre Certified Rebuild Programs extends beyond your equipment with warranties and coverage from Gasbarre — including the support of the largest press service provider in North America. Gasbarre uses ISO 9001:2015 Standard to continuously improve the effectiveness of the Quality Management System. For over 100 years, our company has been providing equipment and support for our clients in many different industries. provides rebuild service and retrofits for presses, furnaces, and other related equipment.